Q-Blue is a temperature control application required for use of the Quantum Northwest qpod 2e, a sample compartment containing a temperature-controlled cuvette holder and its own internal temperature controller. Connect your computer to the controller using a USB serial connection and run Q-Blue for control. The primary purpose of Q-Blue is monitoring temperatures. Use it to monitor the temperature of the cuvette holder. Connect a Series 400 or Series 500 thermistor probe to the external probe input on the corner of the qpod 2e body and use Q-Blue to monitor sample temperature. Monitor the Peltier heat exchanger temperature to detect inadequate coolant flow or high coolant temperature. Turn temperature control on and off. Turn magnetic stirring on and off. Set up and start a temperature ramp (by setting the rate and the final temperature). While Q-Blue cannot communicate with a spectrophotometer to directly coordinate temperature with absorbance or fluorescence intensity, coordination can be accomplished. 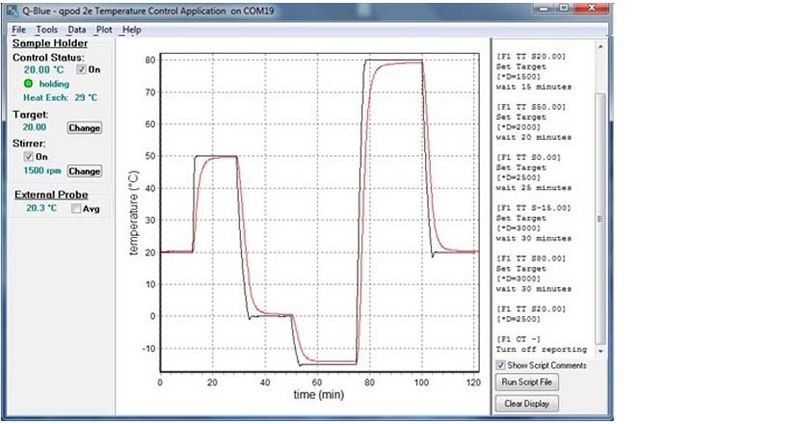 The control program that operates the spectrometer can be set to report data (e.g., single absorbance or fluorescence values) at a specified time interval and to save the resultant data to a file. By specifying the same reporting interval for both T-App and the spectrometer control program, and starting the two processes at the same time, the resulting data can be moved into Microsoft Excel to obtain absorbance or fluorescence as a function of temperature. Please see DNA melting data obtained in this manner, using a miniature spectrometer. Q-Blue communicates with the temperature controller using simple text commands. A Script is a text file containing a group of these text commands to be executed sequentially by Q-Blue. Generally, Scripts can be generated to automate, and accurately reproduce from day to day, the temperature control process and stirring. Q-Blue is provided free of charge to all purchasers of a qpod 2e. It will not work with other QNW products.